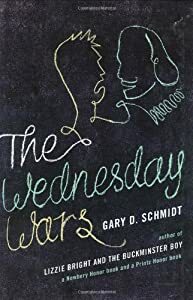 I just now finished reading The Wednesday Wars by Gary D. Schmidt. Wow. What an amazingly great book. It’s a very humorous and fun read. I love the characters in it (except for the main character’s dad. But there’s even something to like about him, too.) It’s really well written. There are some great passages in it. It takes place in 1967 and chronicles the 7th grade school year for Holling Hoodhood. On Wednesday afternoons the children in his small Long Island town go to thier respective temples or churches for religious study (brought back memories of Catechism form me. shudder). Holling is the only Presbyterian in the seventh grade, thus, no after-school religious classes. So he is stuck with his teacher, Mrs. Baker, who, he is sure, has it out for him. She has him do menial tasks but when those run out she begins to have him read Shakespeare. Which he likes and memorizes. There are some very memorable vignettes in this book. My favorite is when Holling is in the town’s Shakespeare Holiday Extravaganza on the same evening that Mickey Mantle appears at the local sporting good store to sign baseballs. He barely makes the MIckey Mantle appearence, which is good, but he is snubbed by The Man himself, which is bad. A great read. Highly recommeded.